Fence costs in Fairfax, VA, can vary widely depending on the materials used and the specifications of the fence. Before you contact professional fence companies you can calculate an estimate of your projected fence cost. Below are some tips to follow when estimating your fence installation options. The most common fence material choices today are wood, chain link, and vinyl. Ornamental fencing, typically more expensive, is available in aluminum, steel, and iron. Following legal and community requirements, establish your fence line and determine the height of your fence. Calculate the number of corner posts, line posts, and gates you need. Most post distances vary between 6 and 10 feet depending on the material and the fence height. Add $2 – $5 per linear foot for removal of an existing fence. If your property is hilly or pitted with obstructions, factor in an additional percentage of your total cost. Most fence contractor estimates will include all materials, parts and labor. Wood fence costs in Fairfax, VA, depending on the wood species, will be $15 – $25 per linear foot. Chain-link fence cost in Fairfax, VA, runs about $8 – $15 per linear foot. 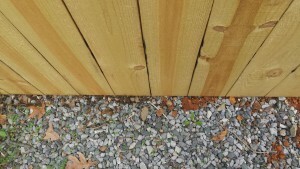 Vinyl fence installation in Fairfax, VA, typically costs $25-$35 per linear foot. Aluminum fence installation in Fairfax, VA, costs between $8 – $30 per linear foot. Wrought iron fence costs in Fairfax, VA, range from $25 – $100 per linear foot. Once you have a rough estimate you are ready to call in the contractors. Contact the fence experts at Hal Co Fence for honest answers, cost-saving ideas, and a world-class fence at an affordable price.